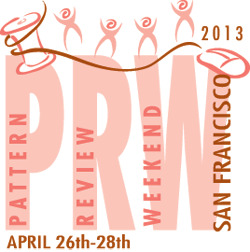 Just returned yesterday from a week vacation in San Francisco, not only did I attend Pattern Review Weekend I took a much needed vacation to the lovely city since this was also going to be my first time visiting California. Pattern review weekend was awesome along with meeting guest speaker Sandra Betzina, I met a few new PR friends, Marcia, Jennifer, Michele, Rosalia, Tina and so many more, this was my second PR weekend and it was good to see some of the PR members I met at my first PR Weekend in NYC 2012 plus Deepika, Bonnie and the other volunteers. Sandra Betzina brought her sample garments for some of the patterns she created for vogue, it was nice to get a up close look at the completed items, plus frabric and color choices. The best though was the information Sandra shared on fitting, having only sewn for a short time, fitting to me was always daunting, apart from taking in the sides of an item that was too big, that was the extent of my knowledge on fitting, but not anymore after attending a seminar with Sandra I am now filled with new knowledge and material to help me through most fitting issue I may encounter, at least I hope it does LOL. I picked up Sandra's book Fast Fit, plus the today fit pattern V2948, a pair of KAI scissors, some organza, rayon facing, point turner, wonder tape and stay tape right at the seminar, I love shopping made easy. At dinner that night I won the Angela Wolf Runched-T pattern...sweet. I went shopping at Britex, the store had such lovely luxury items, I picked up some light weight power net after Sandra Betzina shared a lovely top she made using the material. I have a jersey knit fabric I am planing to make into a blouse and now I am thinking of adding in some light weight power net to the mix that should be interesting. These pattern review weekends can become a bit addicting, one I love to travel and if they keep going to interesting places that I have never been, I may...I might, I probably will be going to another one. I will post more about my San Francisco vacation soon. Hi it was great meeting you! Let me know when you are in the area so we can go fabric shopping. I am glad you had fun at Britex. Hi Marcia great to meet you too, had great fun. I enjoyed being in San Francisco, I will be back and looking forward to going shopping when I do.